With Discount Ninja you can easily offer a promotion only to those that were retargeted by our Facebook ad. If you're not retargeting, you're leaving money on the table! Facebook allows you to remarket your ads to an audience you define. This allows you to serve your ad again to those who have previously shown interest. As we know the buyer journey requires multiple "touchpoints". In other words, we want to send our promotion to a customer multiple times to familiarize him with our offer, to gain his trust and simply stay top of mind. When the right moment comes they will hopefully remember your offer or click through. Facebook allows you to retarget your customer through a number of means, one which is known as Dynamic Ads, learn about them here. 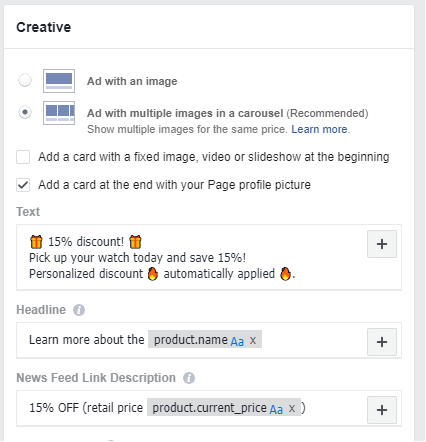 Basically, Facebook shows your prospective customers an ad that consists of a carousel of products they visited on your shop earlier. You can add a custom message to it and, with Discount Ninja, you can link it to a promotion! Offering a promotion in a retargeting ad can be a useful strategy to convince prospective customers that are "on the fence". Those that are not quite sure may purchase when presented with a convincing incentive. If you haven't created your promotion in Discount Ninja yet, do so now. To find your token follow the instructions outlined here. Scroll down and find the section "Tracking". By simply adding the token to the URL Parameters of the Dynamic Ad in Facebook we can offer special pricing, only available to those that were retargeted by our Facebook ad.